Sneak peek revealed of desktop publishing app Affinity Publisher. It's been a good year for Serif, the company behind vector graphics editor Affinity Designer and image-editing app Affinity Photo. Not only was Affinity Photo on iPad recently crowned Apple's app of the year, but it's also made significant progress on its highly anticipated desktop publishing app, Affinity Publisher. 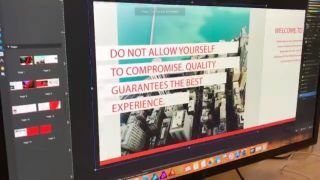 Teased in a witty video posted on its Twitter and Facebook pages, the clip gives a glimpse of an early alpha build of Affinity Publisher. This comes in advance of a public beta due in the summer of 2018. Check it out below. It might have been a long time coming (Affinity thanks its users for their patience), but for fans of the platform that doesn't tie you down to subscription deals *cough* Adobe *cough*, it's sure to be worth the wait.